I've seen this little dupe for my favourite OPI Rainbow Connection Nail Polish on a few blogs, But I couldnt find it in shops or on ebay so I ended up wholesale buying a few lots so I could have one as a backup (counter productive, I know). Technic Carnival is pretty much exactly the same but much cheaper than the original OPI Rainbow Connection and I think its a bit nicer as its not stuffed full of silver glitter. Great for layering and looks lovely alone too. 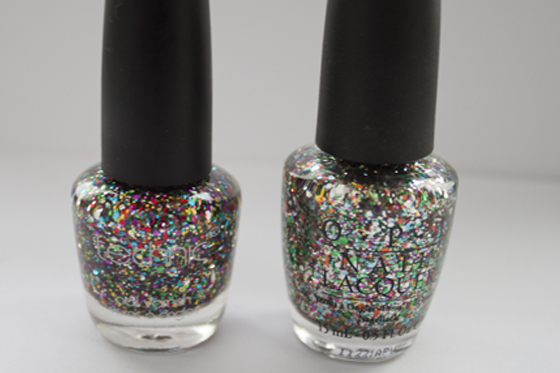 Its a clear polish jam packed with multi sized and coloured glitter particles! Anyway Im selling the rest of the lot on ebay for £3 per bottle so feel free to grab one! I've set up a new ebay account just for selling, as previously I just used my Mum's account to buy stuff from and I didnt think it was fair for people to start stalking her feedback. So this is why I currently have no feedback, pinkie promise I'm not a ebay scammer! I have that technic one, I love it! I love all of the OPI glitters, so thanks for this dupe! I might have to treat myself to the technic one for only 3£! It looks exactly the same! impressive! My mum has just bought me this Technic varnish for christmas... she found them in Bodycare! I love it so much... I have it on over red varnish right now! I nearly bought the same one from another brand last week. But I didn't and bought another color. Now I almost regret it. Amazing dupe, been wanting Rainbow connection for such a long time as it's just so pretty! £3 is such a bargain, driving me crazy that all my money in the world at the minute is cash so I can't shop online haha! Awesome... they look soo similar! i love my carnival nail paint! I usually don't go for nail polish like this, but for some reason this caught my eye! I feel like I need to be more adventurous with my nails!